My mind seems very oriented towards the stars in recent days, what with todays second UK astronaut Tim Peake (any relation to Mervyn?) taking off for a six month trip up there. Not to mention the imminent arrival of the next instalment of Star Wars. I have to admit feeling a bit giddy with excitement. I might even shell out and go see it. Of course that is if I can be arsed to venture out into the dark. It seems that the more corrosive things are down here the more we look to escaping to space. Its like a far flung northern isle just isn’t far enough any more that we have to look to space to get some peace and distance from the chaos. But more importantly its the annual star spectacular of the Gemenids Meteor shower that signals Solstice is so very nearly here. The nights are as long as they will ever be and soon it will be getting lighter. Yay! Its all inspired me to make this little starry bit of lace. I’ve called it Gemenid. 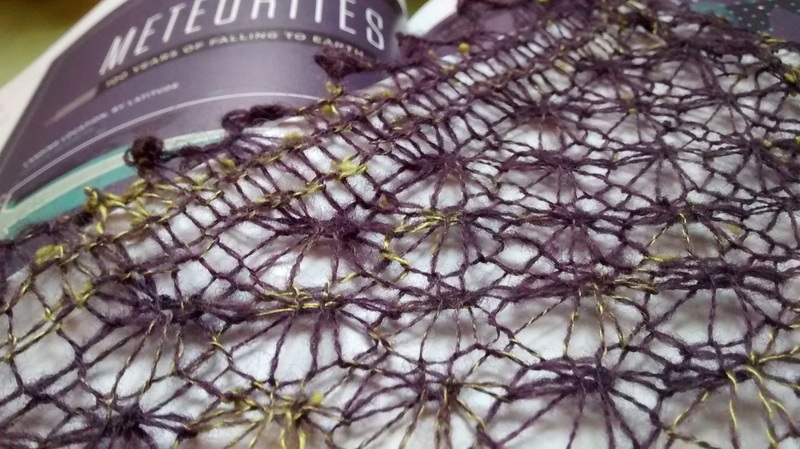 It’s a very delicate latticed lace cowl. I think it looks like a meteor shower in the inky purple night sky. Green silk shines with starry silk neps and shooting stars in silk thread against a gossamer web of midnight purple sky. It has a very pretty pico edge and a lace pattern of bursting stars. Super quick to knit and used less than 80m of lace weight yarn. Shown here in hand spun 2 ply lace weight Romney and silk I hand dyed and spun up a few weeks ago. It’s a real doozy to knit in the round on 6mm circular needles.I have written the pattern up and will be publishing it shortly once I can get the photos sorted. Assuming the sun will come out some day soon. I will keep you posted. In case you are wondering the Gemenid meteor shower is possibly the most reliable spectacular going, running from 4th to 17th December. This year was supposed to a good one as it coincides with a new moon on the 13th and 14th December which means the sky will be dark which will allow even the faintest of shooting stars to stand out against the inky purple night sky. However, we are still waiting a clear enough sky to make it worthwhile to hunker down in the garden in heaps of blankets with a flask of mulled grape juice. It should be wine but we go dry from 1st December until Solstice so no booze till then which might explain the anticipation and rising excitement. If you want to watch it and are fortunate to have a clear sky, look to Gemini (I start at Orion’s Belt and look up and left a bit) from 9pm onwards (peaking at 2am for those of you that are night people – not me I’m a lark and can’t make it much beyond 10pm before sleepy time). Should not be difficult to spot them. The source of this spectacular is 3200 Phaethon, whose orbit passes closer to the sun than any other celestial body, hence it being named after the Greek myth of Phaethon (“the shining” or “radiant one”). Phaethon was a son of Helios (the sun god) and Klymene. Typical of many a young man he wanted a go at driving his dads Chariot (in fact this applies equally to any child and is not gender specific). His dads Chariot was the one that pulls the sun. Dad and mum categorically said no. But Phaethon pestered and moaned and begged and begged and pestered his dad. Helios broke, and handed his son the reigns. It comes as no surprise that Phaethon lost control of the vehicle and the whole shebang ploughed into Africa, setting the earth aflame and scorching the plains of Africa to a desert for ever more. It did not end well for Phaethon. Zeus was so angry about this destruction he struck the boy from the chariot with a thunderbolt. Phaethons flaming body fell down to earth into the waters of the Eridanus river. The image above is by Hendrick Gotzius, his Phaethon is a bit on the very well developed side with the most incredible thighs for a teenager as he goes spirally down to a smoking earth. Incidentally Goltzius also did a rather terrifying Judith with the head of Holofernes, you might like to check it out. This is Olivers hat. I made it as a thank you. I hope he likes chartreuse. Everything I do at the moment seems to have chartreuse in it. I can’t help it. I found this out when he sidled up to me at a concert in the village hall and said ‘ you spin don’t you?’ and offered me one of his fleeces. For free. Gratis. Niet. Well you can’t turn down a man that makes an offer like that! A few days later a potato sack turned up by the back door stuffed with one of the nicest fleeces I have seen in a long time. It was better than many that I have paid for. I have this thing where I can’t take anything for nothing. I have to gift something back. Its good form and helps keep the karma going in the right direction. Hence the hat. But it got me thinking. In the UK sheep are primarily raised for meat, wool is perceived as a by-product of limited value. Shearing is done for welfare, to avoid stress from overheating and from fly strike. Shearing sheep is a cost that erodes still further narrow profit margins. I don’t keep sheep, I don’t have anything to do with the raising of sheep, I don’t shear sheep. I just want their fleece. So I don’t really have any idea of how much it costs to shear a sheep. A quick trawl through the internet didn’t give much information, which normally means the data either doesn’t exist or its held in some vault somewhere so someone can sell it or hide it. Someone somewhere must keep statistics on this – if you know where or have them please let me know. However, the little snippets I did pick up gave a range from £1 – £2.50 up to £4 for longwool breeds. Which must eat into profit margins (if any) possible from the revenue that can be generated from sale of the clip. There are many anecdotal stories of it costing more to shear a sheep than the wool was worth. But, thankfully, things are changing. According to the British wool marketing boards average clip value statistics in 2015 the average clip value was £1.05 per kg. Which makes 2015 a very good year for wool prices. In 2015 wool was actually worth more than the cost to get it off the sheep. Yay! For small holders – the main resource for spinners who like the raw stuff – the costs may be even greater. They are typically not participants in the BWMB. They generally have smaller flocks. The costs of shearing will be higher. Typically smaller flocks mean a greater outlay in terms of transport and overheads for the shearer or a slower rate of clipping for the smallholder which increase costs. Indeed, many smallholders undertake the shearing themselves. Often this leaves the small holder with fleece that has ‘no value’ or rather no market. It is not unusual for fleeces to be burnt or disposed of in some other way. If they are fortunate they will know someone who knows someone who spins and they will give it away happy in the knowledge that it will go to good use. So if you get offered fleece for free. Bear all this in mind. Gift something back. Whether it be a crisp £5, some of your time, a cake to go with the cup of tea you will inevitably be offered or a beautifully hand spun hat/scarf/teacosy/gloves/doily or whatever you have made from said fleece. Answer this question: Do you work for free? Why would you think that someone else would not deserve the same?